In this age of specialization in high school sports, it is becoming rarer to find even a two-sport standout, let alone a student-athlete who excels at an All-State level in three different sports. However, Mt. Vernon’s Shane Williams is that rarity. After completing an all-everything senior season on the gridiron, Williams is now in the midst of helping lead the Mt’neers back to the Class 3 Final Four on the hardwood after Mt. Vernon’s third-place finish a year ago. This spring, Shane will look to once again return to the state championships in three different field events, with an eye toward earning some individual state titles in the long jump, triple jump, and high jump. Basically, Shane Williams is a coach’s dream. He always works hard, never complains, gives it his all, and leads by example. It certainly helps that he was blessed with athletic ability, but Shane has never taken his talents for granted. Instead, he has developed his talents through endless hours of sweat and practice. Oh, and Shane did say that he “kisses his cleats” before football games to make him run fast, so there’s that, too. “I feel that I’m a versatile athlete, and in every sport I do, I give 100 percent,” said Shane. “I believe I was blessed with natural athletic ability.” Go ahead and add humility to the list of adjectives, because Shane Williams is not the type of kid who will tell you how good he is, but rather possesses a quiet confidence. Maybe it’s better if Shane’s coaches describe him as an athlete. This fall, Shane rushed for 1,302 yards on 193 carries and scored 12 touchdowns, and also caught 16 passes for 322 yards and another touchdown. Defensively, Shane registered 84 total tackles, picked off a pair of passes, forced a fumble, and blocked two field goal attempts. Shane was just named 1st-Team All-State as a defensive back by the Missouri Sportswriters and Sportscasters Association (MSSA). 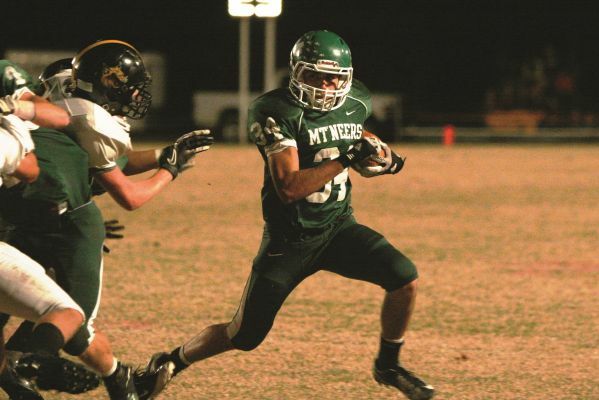 He also garnered 2nd-Team All-State recognition by the Missouri Football Coaches Association, as well as 1st-Team All-Big 8 Conference recognition as both a running back and defensive back. For his career, Shane rushed for 2,468 yards on 415 carries (a gaudy 5.9 yards per carry), while also adding another 1,027 yards on 54 receptions—an impressive 19 yards per reception. Williams scored 34 touchdowns in his career. Defensively, Shane made 194 tackles, picked off seven passes and recovered four fumbles. Shane has posted some equally impressive numbers on the basketball court, and has been a key cog on teams that have captured three-straight District titles and been to a pair of Final Fours. Despite limited preseason practice due to football, Shane began this season by averaging nearly 15 points per game. Entering this season, Williams had scored 947 points, grabbed 294 rebounds, and recorded 98 steals, all while shooting over 50 percent from the field. Shane’s postseason accolades are too numerous to mention, but include 1st-Team All-State recognition by both the MSSA and Missouri Basketball Coaches Association (MBCA) last season. Shane is also one of the top returning track athletes in the state—regardless of class. 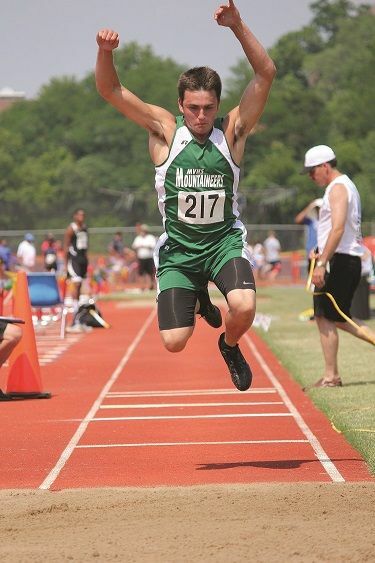 Last spring, he qualified for the Class 3 state meet in three separate events: long jump, triple jump, and high jump. Competing over two scorching hot days in Jefferson City, Williams brought home podium finishes in all three events. Although Shane has been successful in each sport he has competed in at Mt. Vernon, the root of his success actually begins at home. Shane is the middle child of Doug and Linda Williams’ three children. 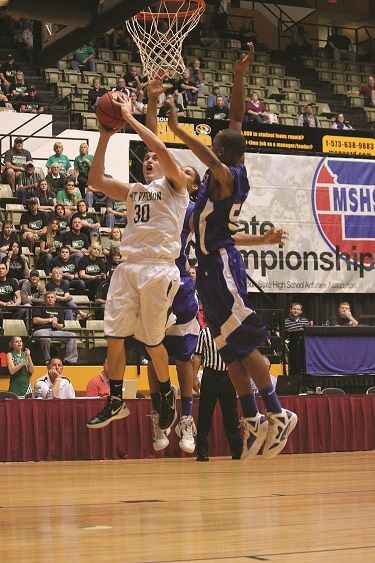 His older sister, Kenzie, helped guide the Lady Mt’neers to a Class 3 state championship in 2010, and is now starring on the hardwood nearby for the Missouri State Lady Bears. Shane also has a younger brother, Trace, who is a freshman at Mt. Vernon. “In about third grade, I noticed Shane becoming very intense and competitive in games around the house and sporting events,” said Linda. “I could also see him growing physically and developing his coordination. Shane could pick up about anything and do it well. Describing Shane as a servant-leader is not surprising when you consider that Shane lists his priorities as “God, family, sports,” in that order. “I do my best to put school in front of my sports, but that’s not always easy,” said Shane. Any coach who would not want a player of Shane Williams’ caliber and character probably should just kiss their cleats to help them run fast out of town. Originally published in the November 2012 issue of Ozark Preps Illustrated.